Team I.C.E. shows off their medals and trophy awarded to them for winning the research award at the Georgia First Lego League State Championship held at Georgia Tech. (L-R) Back Row: Michael Baksh, Bre’Yon Guidry, Tyson White, Darion Nandial, Jaden Torres; Front Row: Nicholas Jenkins, Dylan Felker, and Madison Lohr. Photo/Fayette County School System. Flat Rock Middle’s First Lego League (FLL) team, Impressive Coalition of Eagles, or I.C.E. 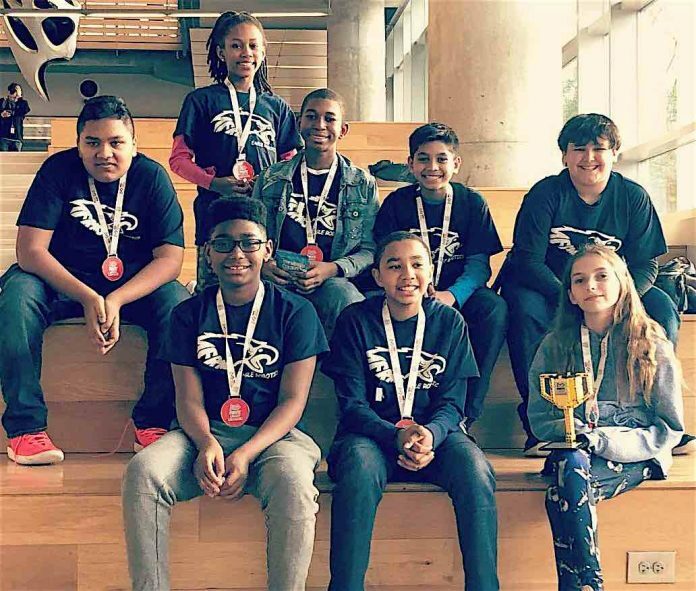 for short, took on the state’s best middle school robotics teams at the Georgia FLL State Championship and won one of the top prizes. After winning the research award at both the regional and super regional competitions, the team maintained their winning streak and brought home the research award from the state competition, which was held Feb. 2 at Georgia Tech. Team members are Madison Lohr, Bre’Yon Guidry, Imani Newton, Dylan Felker, Nicholas Jenkins, Tyson White, Darion Nandlal, Jaden Torres, and Michael Baksh. The team is coached by Melissa Lohr. Each year FLL teams are challenged to think like scientists and engineers to solve a real world problem. This year’s challenge was to solve a problem humans could face during long distance space exploration. I.C.E. chose to focus on the mental health of astronauts being separated from their lives back on earth. After the team discussed what they would take with them if they were traveling to Mars, one thing was constant, a cat. So, they got to work researching the benefits of pet ownership, and from there developed a two-part innovative solution. The first part uses an augmented reality (AR) program that would allow astronauts with AR glasses to view their pet floating in space with them. The second part is a lifelike plush companion pet, custom made to look like the astronaut’s pet, with sensors designed to stimulate many of the senses associated with pet ownership; therefore, helping to reduce the feelings of isolation and loneliness. This is the second team from Flat Rock Middle to compete in a state FLL championship.